Lael Wilcox took the ultra cycling world by storm when she won the Trans Am bike race in 2016, beating not only all the women…but all the men too. Her story is fascinating. 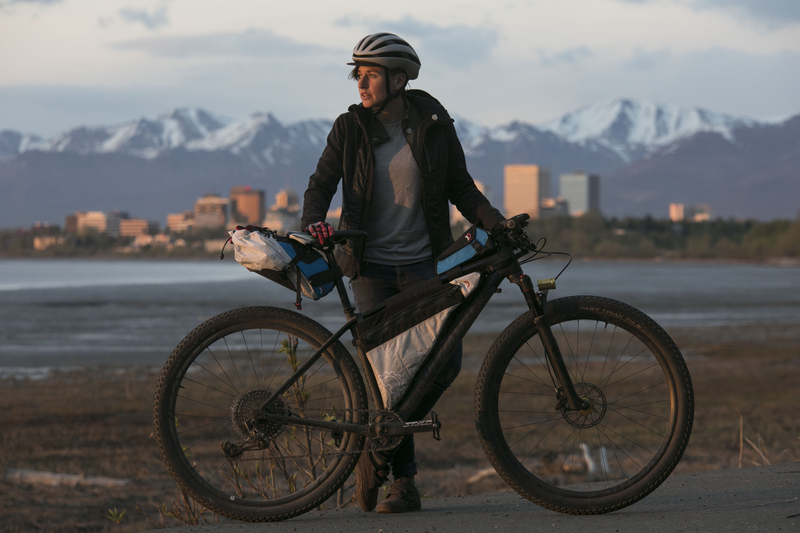 She went from being a full-time bike bum riding around the world with her boyfriend, to being a full-time ultra distance competitor in just a couple of years. Her casual attitude and soft-spoken nature belie a fierce nature, leading to her being crowned one of the world’s most successful ultra cyclists. Lael uses komoot to recce race routes, plan training rides and in general…for exploring the world. We caught up with her after the Navad 1000 race in Switzerland which covers 1000 kilometers (620 miles) with 30,410 m (99,770 ft) of climbing. During the race, she put in one mighty performance: completing it in 4 days, 10 hours and 6 minutes to become the second woman ever to complete the race— smashing the previous record in the process. Tell us how you got into riding bikes? I first started riding when I was 20 years old to get to and from work while I was studying at the University of Puget Sound in Tacoma, Washington. The commute was 6 kilometers (3.7 miles) in each direction—just a little too far to walk. Later that year, I wanted to visit my sister in Seattle, but I didn’t have the $2.50 bus fare. Therefore, I decided to ride my bike the full 70 kilometres (43 miles) to visit her—a ride that to this day still feels like the longest of my life. And something dawned on my while I was on the road: if I could ride from one city to another, I could ride across the country. It was after 9 months of traveling in Eastern Europe, South Africa and the Middle East that I entered my first bikepacking race in 2015: The Holyland Challenge, a 1,400-kilometre (869-mile) mountain bike route that winds through the entirety of Israel. I was the only woman and the youngest rider. I rode my touring bike, an old steel Raleigh 29er with platform pedals and running shoes. Everyone thought I was joke—that I wouldn’t make it past the first day. However, by the end of the first day, I was 40 kilometres (25 miles) in front of the man in second place—and I was having the time of my life. After the Holyland Challenge, I decided to race the Tour Divide, a 4,420-kilometre (2,700-mile) mountain bike race from Canada to Mexico. From Israel, I realized that I had just enough time to fly home to Alaska, put together a race bike and ride the 3,400 kilometers (2,100 miles) from Anchorage to Banff to the starting point of the Tour Divide. So, I did. It was an incredible ride—I rode past around 100 bears, riding in nearly 24 hours of daylight. It was my first long solo ride. I completed it in 19 days, took a week off to rest and then entered the race. Then I set the women’s record on the Tour Divide at 15 ½ days (previously 19 days). We read somewhere that you win because you sleep less than everyone else…(as well as obviously being superhuman-strong) How do you cope with this? Do you train specifically to cope with sleep deprivation? Typically, I don’t sleep less than everyone else. During longer endurance races (the Trans Am and the Tour Divide), I usually get around 4-5 hours of sleep a night. Some people I’ve raced against only get around 1-3 hours, but I find that if I’m out on a route for around 2 weeks, I need at least an average of four hours a night. During the Navad 1000, I slept a total of 9.5 hours for the entire race that took me 4 days 10 hours. I didn’t expect to sleep so little, but kept waking up naturally after about two hours of sleep. I don’t think this strategy would work for a longer race, but it was actually fine for the Navad and kept the race exciting. I was battling back and forth with Stepan Stransky, the eventual winner of the race. You rode the Navad 1000 course before doing it. Would you recommend doing this? What are the advantages? I had so much fun riding the Navad 1000 course before the race. It gave me the opportunity to become more familiar with Switzerland, get to know the course and get in some good training for the race. 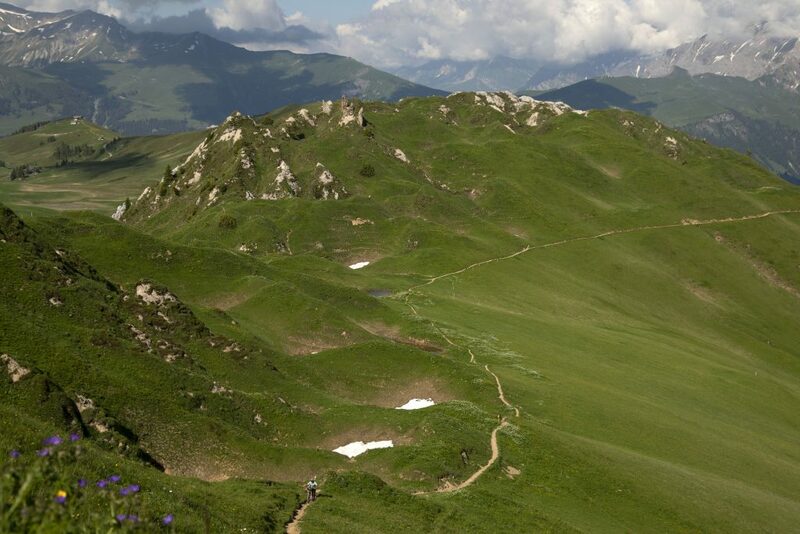 The Navad route includes 33,000 meters (108,250 feet) of climbing and it is very steep. I would definitely recommend scouting the course before the race if you have enough time. It’s a route worth riding at least twice. We saw you’d been battling it out with the eventual winner at the Navad 1000. Were you just riding your own race or were you trying to keep up with him to take 1st place? If so, is that motivating? I am competitive, but only for fun. I love racing against other people, but I’m only motivated by positivity. I know deep down that if I don’t do my best, I’ll be disappointed in myself. So, it’s easy for me: I just do my best. For the most part, I’m having fun out there. I love being on my bike and living outside. What are your upcoming races? Do you have a particular focus or goal this year? My next race is the French Divide on August 4. I will be traveling to France mid-July to scout the course before the race and spend the whole summer in Europe. It’s fun for me to be racing on a new continent. The Navad 1000 and the French Divide are both shorter races than I’m accustomed to. Shorter distance means less sleep deprivation, a nice change. What would be your all-time dream trip on the bike? Oh wow, I have no idea. One of the most exciting things about this lifestyle is that I never know what I’ll be doing next year. There are definitely some countries that I would love to travel in. Georgia is one, Kyrgyzstan another. Hopefully I’ll make it there in the next couple of years. Do you have one race you’d really like to conquer? Not really. I’d like to take another stab at the overall record for the Tour Divide, but maybe in a couple of years. For now, I’m really happy racing in new places. What do you like the most about komoot? I like how easy it is to plan with komoot! I took a back seat in the past when it came to route planning on our travels around the world. Komoot gives me the power and confidence to plan and navigate without the hassle of carrying maps or the stress of having to remember cues. It’s also really useful to just let it do the job, when you are focused on competing in a race.